"The First Snows Of The Season In The Northern Forest!" The first signs of Winter arrived this week, right on the six week forecast of the Fire Weed in September. Nature's predictions are better than the Meteorologists! It was also a great week here for running the dogs with colder temperatures. We were able to get 4 days, of two 14 Dog Teams per day, of quality runs. The dogs, especially the young ones, handled the increase in training without any problems. Even though it has been a slow start to the season, the dogs are running great putting in super runs. Couldn't be more pleased with their progress! We are expecting friends from Switzerland to arrive here for a few days to finish their North American vacation. Looking forward to their visit. The last time here was two years ago. Dogs are resting here for the next two days after their four days of running. "Warm/Wet Weather Continued In The Northern Forest!" Even though the weather was still warmer than usual, we were able to get in three days of running. On Monday and Wednesday, we were able to train only one team each day. However, on Thursday with colder temperatures, we trained two teams of 14 dogs each. With Clement's help, we were able to complete running two teams in two hours. That means from getting the equipment ready, harnessing/hooking up the dogs completing the run, snacking /watering the dogs after the run , returning the dogs to their homes in the kennel and then repeating the same procedure with the second team and finally putting away all the equipment after the last run. I love efficiency and organization! Even though the number of runs are down from previous years, the dogs are progressing nicely. We have four of the Yearlings (Libby, Lilly, Lance and Louis) in the "A" Team and they are fitting in with the experienced dogs as if they have been running for many years. Lloyd and Levi are in the "B" Team. I wanted Lloyd to run with his kennel neighbor Darth as I thought this would make a good pairing and it has. Eleven of the fourteen dogs in the "B" Team could all run in the "A" Team. Two of the others are still a little inconsistent on their training runs. Levi's problem is that he has not yet learned to pace himself with the rest of the team. He has a tendency to work to hard /fast in the beginning of the run and ends up tiring himself out before the end of the run. Due to this, we need to stop and rest the team on the run to give him an opportunity to recover. I decided to run him behind Willy, the most experienced dog in the kennel, to learn to pace himself. After only two runs, I can see Levi improving and getting into sync with Willy and improving his stamina. Levi is also the biggest of the yearlings and still growing. He is still a little immature physically and mentally. His father, Blue, was the same at this age. Blue developed into one of the best most dependable dogs in the kennel. Patience is priority in working with young dogs for their development. The weather forecast is for heavy rains and strong winds for the next three days and then colder temperatures with a chance of snow. Hopefully, we soon be able to get on a regular running schedule. "Warm Weather Continues Here In The Northern Forest!" Although warm weather continued here this week, we were able to get the dogs out running on Tuesday and Friday. On Tuesday, we ran the yearlings in a 10 dog team with 4 experienced dogs at the front of the team. This was the first run for last years puppies in a big team and we wanted to evaluate their capability to run in a 14 dog team as we wanted to train only two teams on training day. They did a great job and proved they were ready to run in a big team. Friday was the first time we ran the two 14 dog teams with 4 of the yearlings running in the A Team and 2 in the B Team. The Yearlings in the A Team fit in perfectly and Lloyd ran with Darth in the B Team. All 5 of theses dogs did great. Levi, the 6th yearling, runs out to fast in the first half of the run is tiring for the last half. On his second run there was some improvement. He is the biggest of the yearlings and is still developing mentally and physically. We just need to be patient with him through this stage as he has the ability to be a super racer. The above video and the one on the training page is off the yearlings first run of this season. Next week the weather forecast is for colder temperatures. "Warm/Humid Weather Returns To The Northern Forest!" Unfortunately, we were only to get on one day of training due to warm/humid weather. This time of the season, we have to be very careful not to overheat the dogs. We will not run the dogs unless the temperature is at a minimum below 10 Celsius and low humidity. We ran two teams of 10 of experienced on the first day. They we crazy to go as would be expected for the first run. Luckily for me, I had my new Handler, Clement Louvard, here to assist with the run. The dogs did good for the first run. The Yearling team did not run as the temperature was already to warm after the first two teams. Even though we started at 8 am and were completely finished by 10.30 am. The above video is of the second team with Darth having his first run at lead. Clement is here from France and arrived here at the kennel on Sunday. He did a real good job for his first time and he is a very quick learner. Due to the temperatures, we spent the rest of the week making the pieces to repair the dog houses that need new fronts and roofs. Next week is supposed to be cooler, so we hope to get in more training runs. "The Mornings are About To Change in The Northern Forest!" With the advent of Fall, most people think of the end of Summer and dread the onset of Winter. 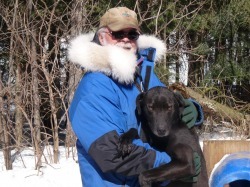 But, here at Miortuk, it is the excitement of another great season of running Sled Dogs. Starting Monday, the sound of enthusiastic dogs will break the morning silence and the training here will commence. All is in place, the morning temperatures are cooler and the dogs are ready to go! The new Handler/Trainee arrives tomorrow and his new adventure is about to begin. The truck needed some bumper reinforcement this week to ensure the dogs don't pull it of when we hook them to the truck before their morning run. Yes, excitement is in the air!! !